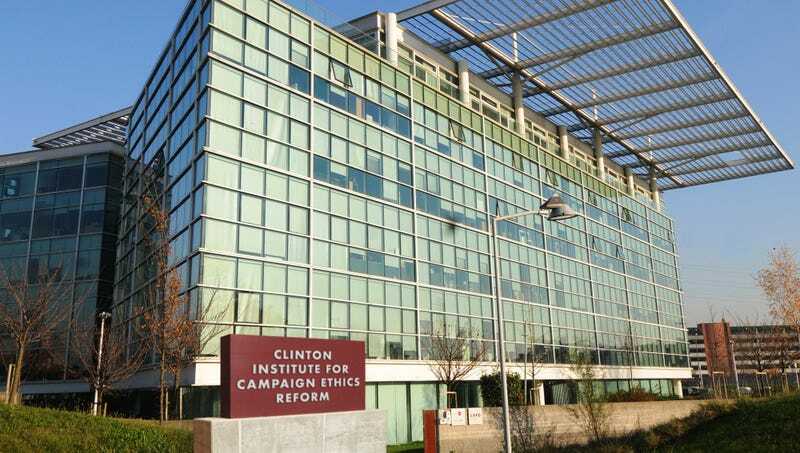 WASHINGTON—Saying that the new organization would be aimed at upholding the political party’s standard of conduct and ideals, the Democratic National Committee unveiled Thursday the Clinton Institute For Campaign Ethics Reform in response to recent allegations of election rigging during the 2016 primary. “The DNC is taking these claims of misconduct very seriously, which is why we have founded, with the help of a generous $40 million donation from an anonymous benefactor, this new institute whose main focus will be to look into corruption claims like these,” said chairman Tom Perez, adding that a committee has been formed to review the party’s practices and will be led by former DNC chair and current democratic Congresswoman Debbie Wasserman Schultz, who eagerly volunteered her services and intimate knowledge of the 2016 election. “The institute’s initial funding will go toward hiring numerous consultants, lawyers, and policy experts whose experience and advice will be essential in retooling the DNC to align with our value system as democrats and Americans.” At press time, the DNC announced plans to maintain the Clinton Institute’s independence by raising capital with several $30,000-per-plate fundraising dinners.